A little time ago, I heard about a V-day swap and it's finally time to show off our presents!! I was matched up with Cassie from C Is For CatLady. Sure, it might have been because we're both Canadians but I think it's because we had so much in common! I had so much fun picking out Cassie's gifts after stalking through her blog for ideas. Because I'm somewhat obsessive and have lots of free time, her package was wrapped and ready to go way before the mailing deadline. Then it was waiting time. Although, not for long! Both of our packages arrived about a week before today. HORRIBLE, if you ask me as the package taunted me every time I passed by the dining room table, where it sat there...mockingly. On Feb 9th, I caved. Cassie was thrilled as it meant she could open hers too. Haha!! 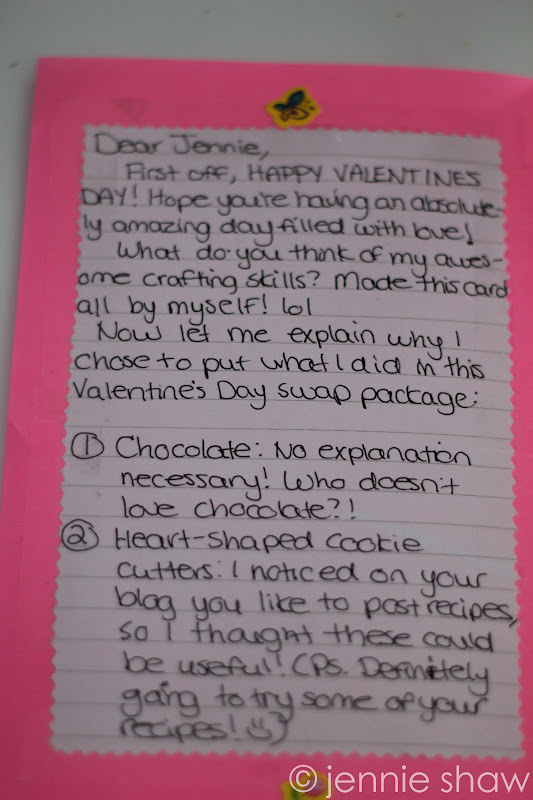 The funny thing is that we both sent each other purple nail polish and heart-shaped cookie cutters! I'm so excited to try out the nail gemstone kit and...well...those chocolates are long gone. And what girl doesn't go through, like, a zillion bobby pins? 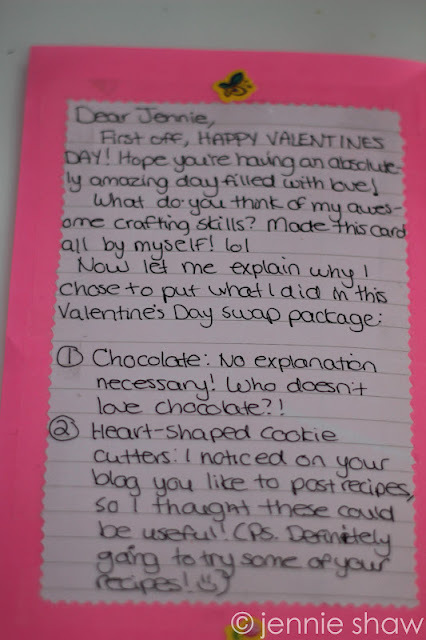 She even made me this cute card to describe why she picked what she did! Thanks so much, Cassie! I love everything! Next time I'm in Toronto visiting, we'll need to meet up in real life!! You'll have to wear your boa so I can recognize you. Haha!! Thanks so much for hosting the Swap, Tara, Meg and Celia! awe, what a bunch of great gifts! I would love those cookie cutters, in fact I think I'll go out and get some later. Oooo you got great goodies! Glad your power is back on, that's no fun! Looks like you grabbed some great things! I am totally loving those cookie cutters! Super cute!! Totally love the heart cookie cutters! Great stuff! What fun stuff! I love that purple color and the note she sent was so sweet! She did so good! Thank you for participating in our swap! I'm happy that you had so much fun with it!! !